This warm dish calls for buckwheat noodles, available in most Asian supermarkets. Thin spaghetti noodles would also work as a last-minute substitute. Bring the broth or water with bouillon cube to a simmer in a large saucepan. Add the noodles and cook at a rapid boil until al dente. Meanwhile, heat the olive oil and sesame oil plus ¼ cup water in a stir-fry pan. 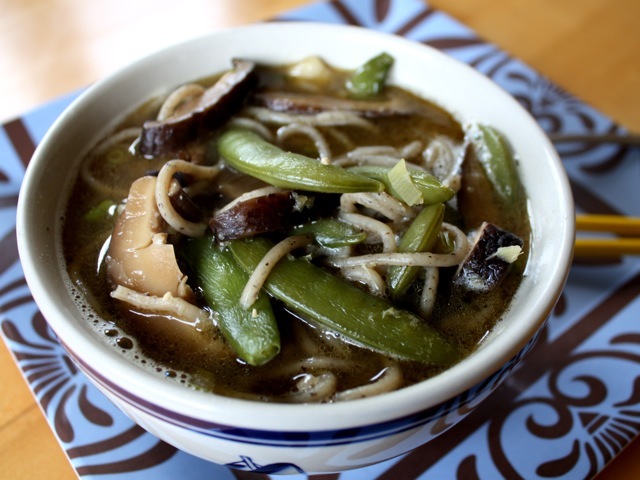 Stir in the ginger and soy sauce, then add the snow peas and mushrooms. Cook over medium-high heat, stirring frequently, until the snow peas are tender-crisp and the mushrooms are wilted, 3 to 4 minutes. Add the cooked noodles and their broth and the scallions. Season with freshly ground black pepper. Cook for 2 to 3 minutes longer. Serve at once in shallow bowls, including some of the broth with each serving. Culinate editor's notes: You can substitute dried shiitake mushrooms for the fresh mushrooms. Soak the dried mushrooms for at least 30 minutes in boiling water, then drain, reserving the soaking water. Slice and discard the mushroom stems and slice the caps into thin strips. Use the soaking water as part of the broth. You can also substitute sugar snap peas for the snow peas; frozen is fine. And, as Matthew Amster-Burton suggested in his column on miso, you can boost the umami flavor of this noodle soup by adding a few tablespoons of prepared miso.